Den Maurlias is a character that was created over ten years ago now by Kamiki as an NPC for the Victorian Legends campaign. He was the NPC that inspired Ambrose ((And canonically, Ambrose is a VERY distant relative (Of a fey from the Maurlias household that was exiled to the human realm)). Race: Den is a fey noble – called an “Eldhe” ( resembling a high elf by most fantasy standards). He has vertical-facing pointed ears. Borderguards are an elite group of the military tasked with protecting the realm from invading monsters (Anju) from raw dream. They are they only fey allowed to carry iron weapons. Setting: Original fantasy "fey realm". Exists in a separate plane hidden deep within the dreamrealm. Exists alongside our world/the human realm/reality. This location was originally fleshed out in our Victorian Legends campaign, but we have explored it alongside modern day incarnations of Sabin, etc. Den is older for a fey, but the toll of a hard combat-filled life is more responsible for his older look than his actual age. He has a bearing of seriousness, competence, and intensity. He has blue eyes and blond hair that has a touch of ash at his temples. He wears his hair in a very tight braid that begins French-braid style at the top of his head and continues into a long braid down his back (not a hair out of place). He’s tall, slender and athletic. He stands around 5’10”, and has a slender, toned figure. On the very rare occasion that Den’s hair is down and out of its braid, it is (to his embarrassment) wavy. Den (and other pure-blooded noble fey) has blue blood. While his uniform would cover them, he has a number of scars – mostly claw-marks over his torso, arms and legs. But he also has a long, dramatic slash-scar diagonally across his chest that has the appearance of a burn (from an iron sword). * A diagram of his scars - the claw marks are kind of general and don't need to be followed exactly. The sword slash and tattoo are the most important. 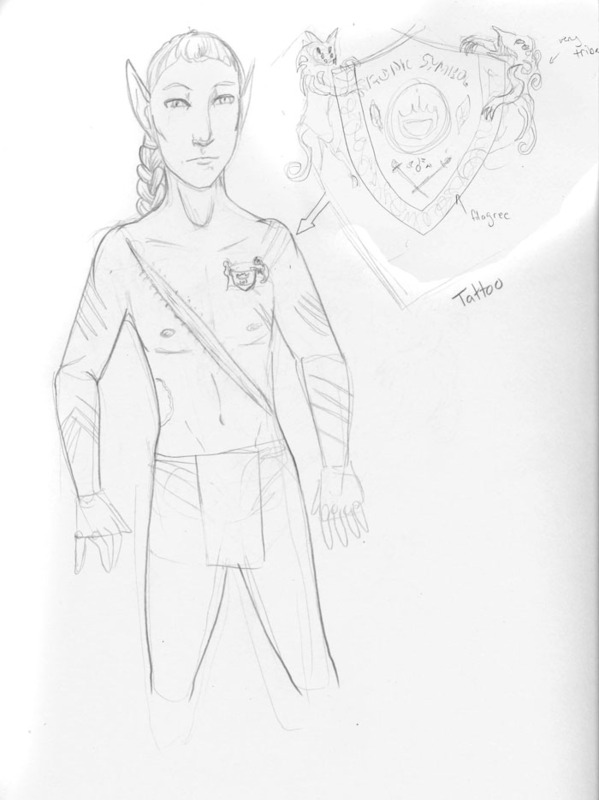 All borderguards also have a magical tattoo over their heart that allows them to sense the presence of Anju. 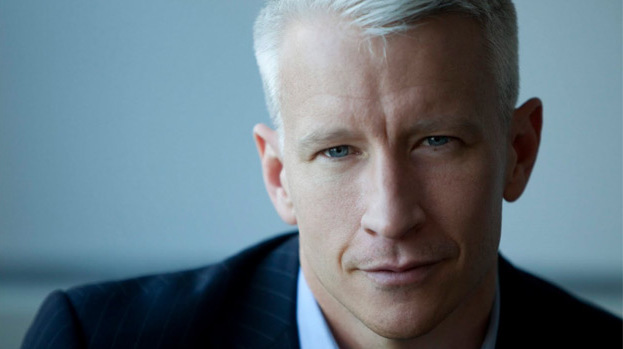 *The best analogy for Den’s facial appearance (and age) would be Anderson Cooper. In the feyrealm, Den is almost always wearing his borderguard uniform (see the main reference image above). There are different variants of the uniform, however, for full dress/presentation, daily official work, and out in the field. He would never be without his (iron-bladed) sword. 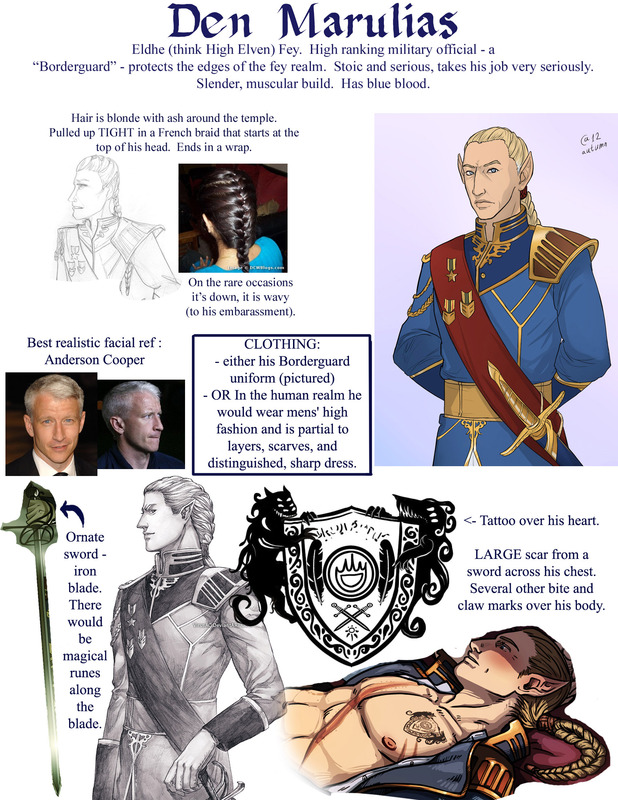 In the human realm (as the storyline has taken him) he is highly interested in mens' high fashion and is partial to layers, scarves, and distinguished, sharp dress. Den is the captain of the Border Guards of the feyrealm – an elite group of fey trusted to wield iron weapons to protect the border of their realm from hostile monsters of raw dream (called anju) that seek entrance to devour Fey. 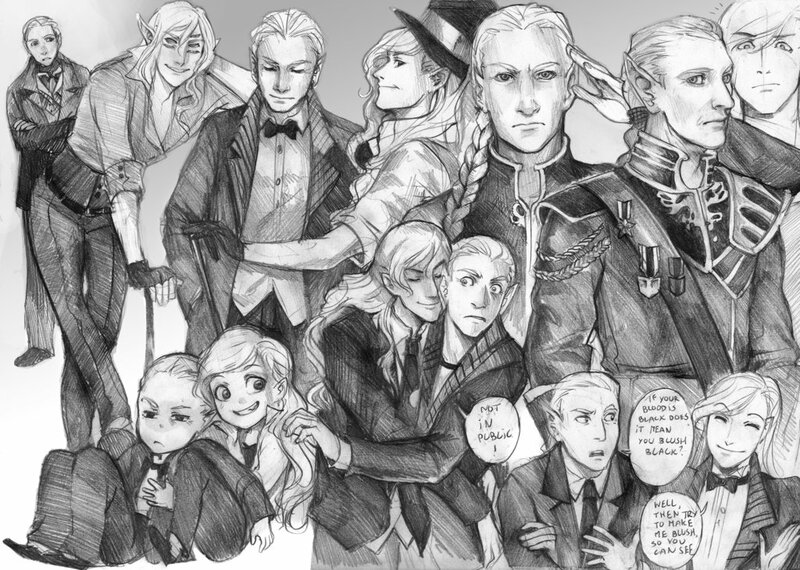 He is almost never seen outside of his uniform – though he does have uniforms for a few different occasions, such as a formal dress uniform and one he wears while on active duty. The primary color of the uniforms is blue, with gold trim and touches. He always has his ornate sword at his hip. Den is obsessed with duty, carries the weight of the world on his shoulders and almost never drops formal decorum and protocol. The man is duty bound and takes his responsibilities with utmost seriousness. Because of this, he is also very repressed… never having had “time” for a relationship, though there is more to it than that. Deep down, Den has passions and drives, but has masks them with professionalism and usually a serious tone. Best Overall reference of Den. Fantastic Face shape and uniform details. The only exception is the design of his sword has a basket-hilt. Art by autumn-sacura on DA. Another very good reference sketch - drawn by Saniika, colored by me This piece by doubleleaf combines all of Den's character traits - from the tattoo to the new sword design. My original character design of Den - this shows the hair style well with a french-style braid that begins at the top of his head. Also, the vertical-pointing ears. Again, the sword design is different from this. A great piece by cris-art that not only is very characteristic but also shows Den's tattoo and the big sword scar along his chest. Great characteristic shots here - while the braid should start on the top of his head, these pieces are otherwise fantastic, and also show Den in some modern real-world clothing. Art by Razuri-chan. Omocha-san's Den really hit all of his features - great job with the hair and sword and uniform. Fantastic reference! 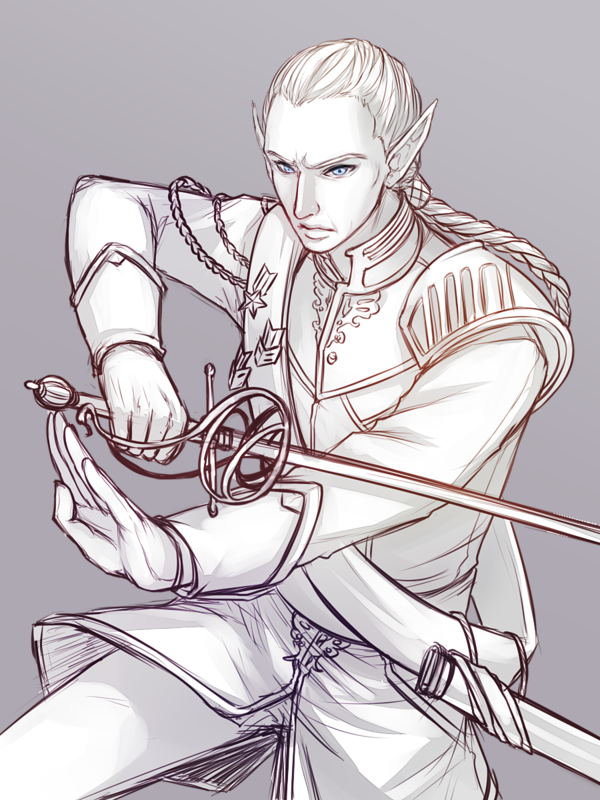 Stellacadente113 really did a great job with Den's face here and has the correct, updated sword design. 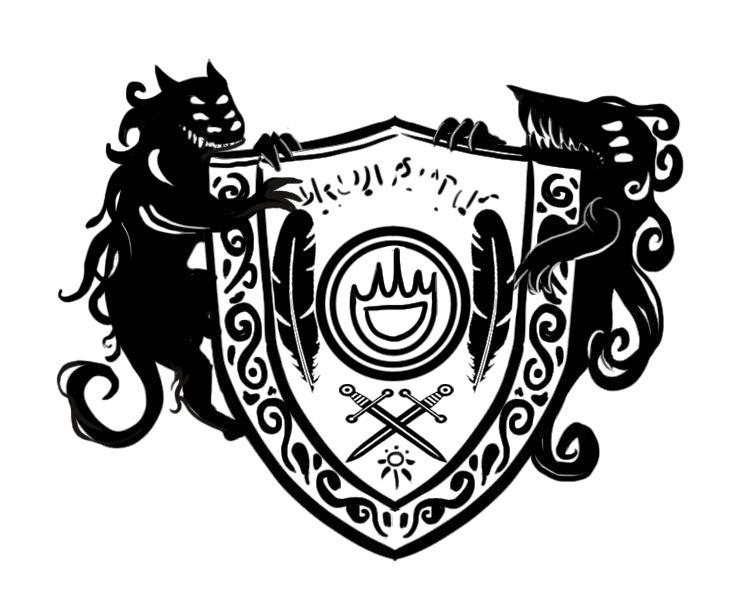 Den's sword would also have runic markings/symbols along it that bear magical enchantments. The pieces above also really nail the full character design! All Den Art : Click this link to visit a page housing all the current artwork of Den Maurlias. 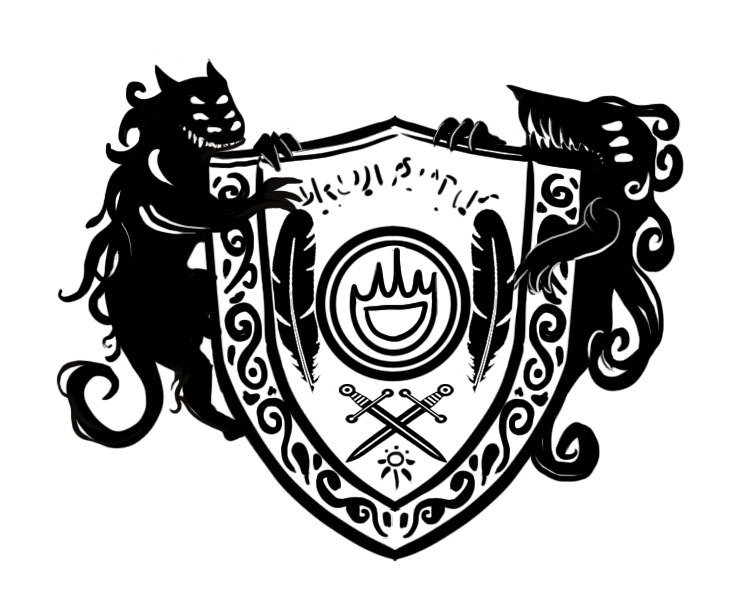 Den has two siblings (an exceedingly rare occurrence in the feyrealm, as births are limited – as the realm in this storyline is closed off entirely, in order for a new fey to be born, one has to first die. 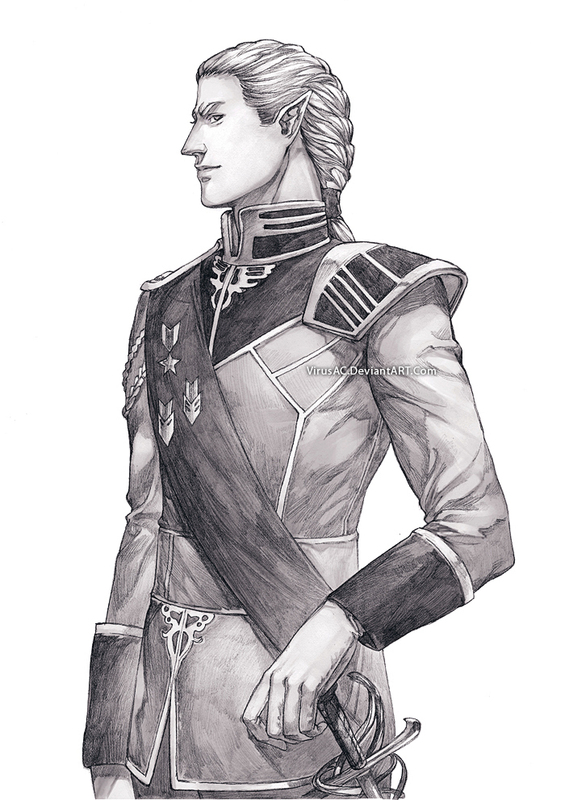 His eldhest sibling, Vespasian, is the titled heir to his family estate and in incredible fop who lives life with a bon vivance and carefree nature. Den thinks Vespasian is far too frivolous and a layabout. Ves thinks Den really needs to loosen up. His twin sibling is Jausserande who is every bit as serious as Den if not more so, but has taken his obsession in the direction of magical study and is an accomplished wizard. 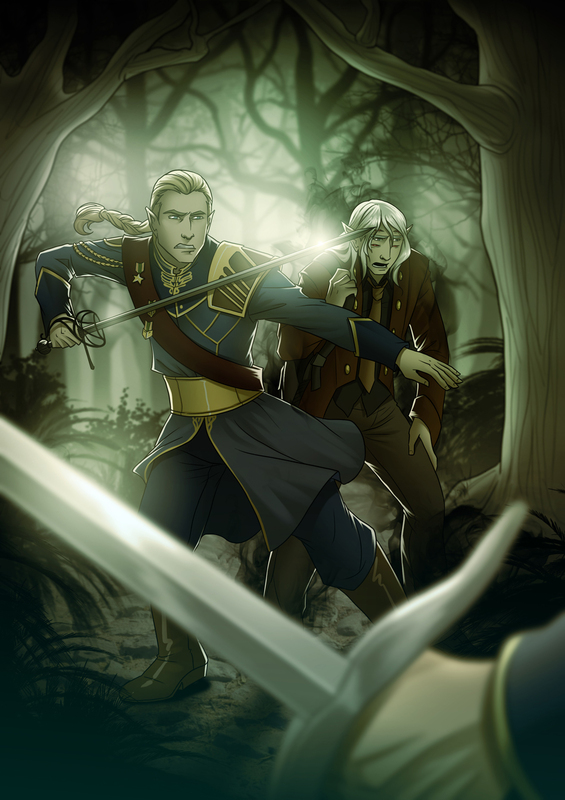 Den and Jausserande don’t really see eye to eye –Den sees his swordsmanship as having purpose and is practical in defending his realm, not agreeing with Jauss’s ivory tower studies for study’s sake. Den also isn’t overly fond of magic as a whole. Jausserande thinks very highly of himself and his intelligence. 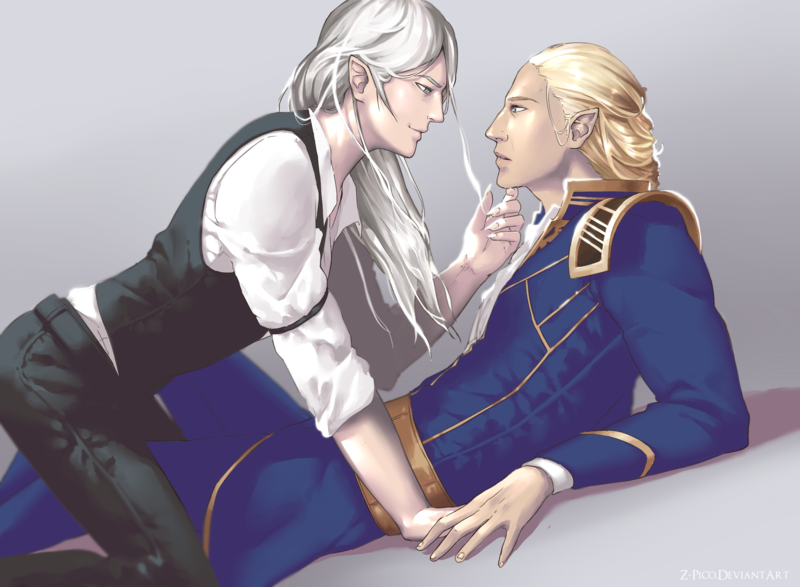 Den and Jausserande are identical twins, but have taken very divergent roles. 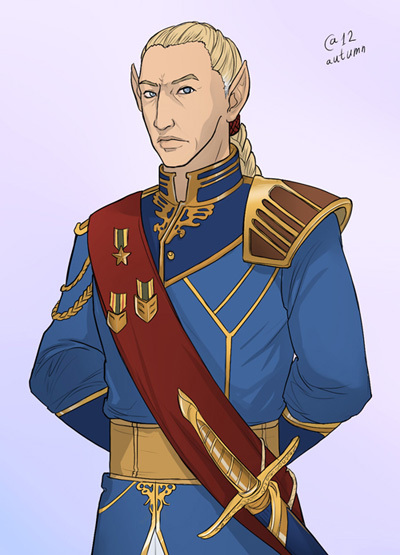 If possible Jausserande tends to be even more serious than Den; is nearly humorless, and as absolutely no interest in most social interactions outside of his study. From a young age, Den knew that he was headed into a military career. The family already had an heir, and Jausserande was going into a magical career. The military was a suitable place for extraneous son (or adopted children). The borderguards in particular are the most prestigious branch – whose lives are dedicated to protecting the land from invading anju. Beyond that, only the borderguards are entrusted with carrying iron. Iron is just as deadly to fey as Anju – and a death by iron undoes those it kills. If Iron is used on a fey, their soul does not reincarnate, and the population of the feyrealm shrinks by one forever. Den wanted to stand out to his family, to carry honor with the family name. Vespasian was already a young man (in his 70s – fey are long-lived) by the time Den was born. He respected his father, but didn’t have much respect for Vespasian’s foppish ways. Den’s mother was also a meek woman, and partially shaped his somewhat misogynistic view of women growing up – she was a passive figure in the household, and sometimes time with her was used as an incentive with dealings his father had with other noblemen. The mandatory balls and galas he attended growing up also didn’t help. Den was frequently mystified by women and while he could appreciate how some qualities might be more desirable than others, he never felt attracted to women – viewing them more as a fine specimen – as one might a well-bred horse - rather than a peer or potential love. And in the fey culture, while one might have a tryst with ones’ own gender as entertainment, or a diversion, true homosexual pairings were rare, and not looked well upon. Fey births are so rare and desirable, so especially in the noble households there would often be a lot of pressure to marry, and once married, to continue to try for children. 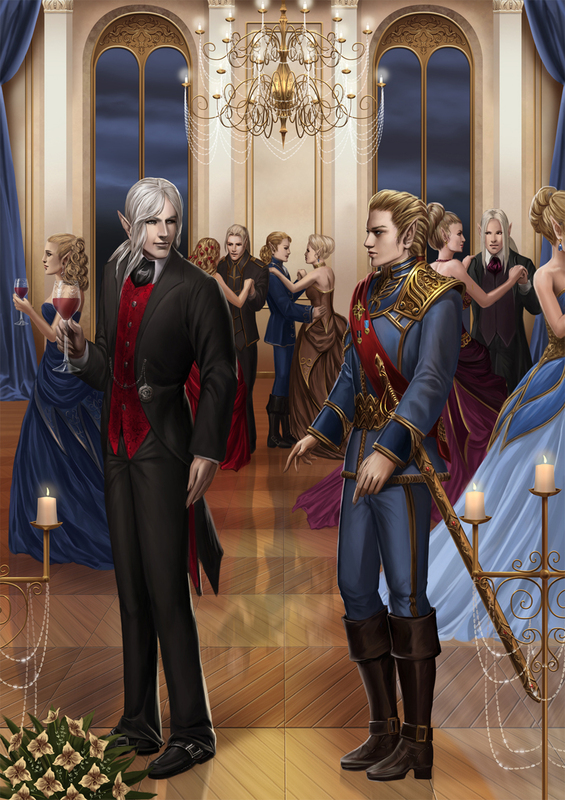 So extra-marital affairs, while not uncommon for fey, would be very scandalous if an eldhe noble were to happen to have a child with, say a beastling, mixing the noble bloodlines. If an eldhe noblewoman were to have an affair with another eldhe man, it was always considered to be the child of her husband. And homosexual relations were viewed as frivolous diversions at best – and not meant to be a replacement for an opposite-gendered spouse. Den struggled with his sexuality, ultimately choosing self-discipline and throwing himself into his work rather than deal with an unhappy marriage or a scandal and disappointing his family. And he was quite good at what he did – his dedication advancing him quickly in the ranks and granting him a spot in the esteemed border guards. But it was through his intensive training program (a twenty-five year intensive training program to make certain the candidates are competent and trustworthy before they are ever allowed to touch iron). They were trained to direct their fear to an instinctive fight response, and any recruits found wanting in nerve, dependability, competence or psychological stability were cut from the program. 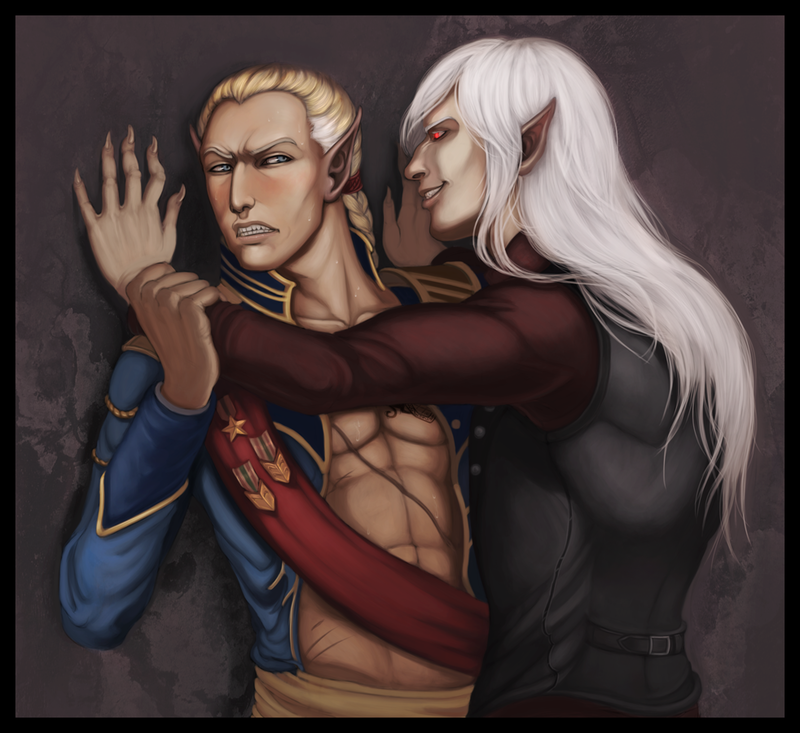 During this training period, Den began to discover feelings for one of his fellow trainees, another young eldhe named Marconius. 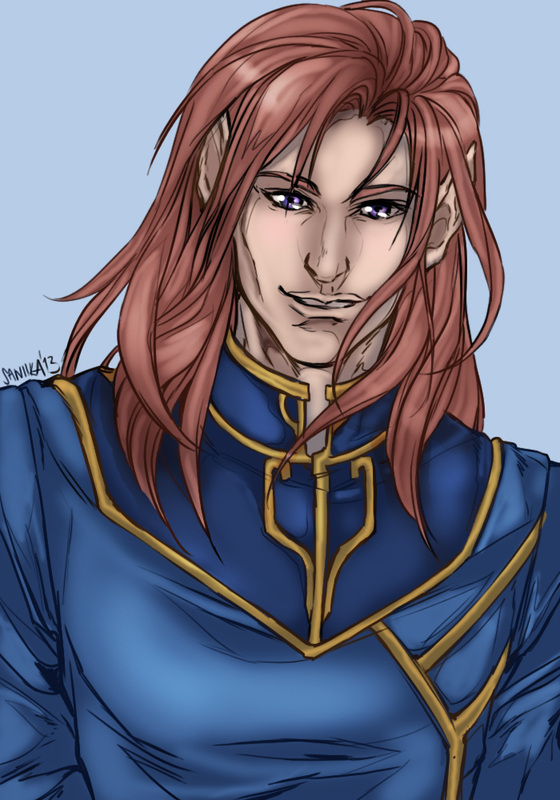 [REF IMAGE OF MARCONIUS] Marconius had reddish hair, violet eyes, and like many eldhe was quite beautiful, although not feminine. He was quick to smile and had a love of life and exuberance that drew Den in. During the training, the recruits were almost never alone or had real privacy, and Den harbored feelings for years. It was a very, very slow romance – stolen glances, a brief touch, but nothing ever said. Some recruits would sneak out and go to town some nights, but Den was always adamant about adhering to rules. 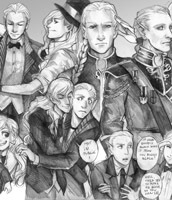 When it finally came time for the recruits to go out to the border, they were sent in pairs for safety’s sake, and Marconius arranged so that he and Den would be stationed together. The stations that the new borderguards held were only a second or third line of defense – not very close to the true edges of Fey. 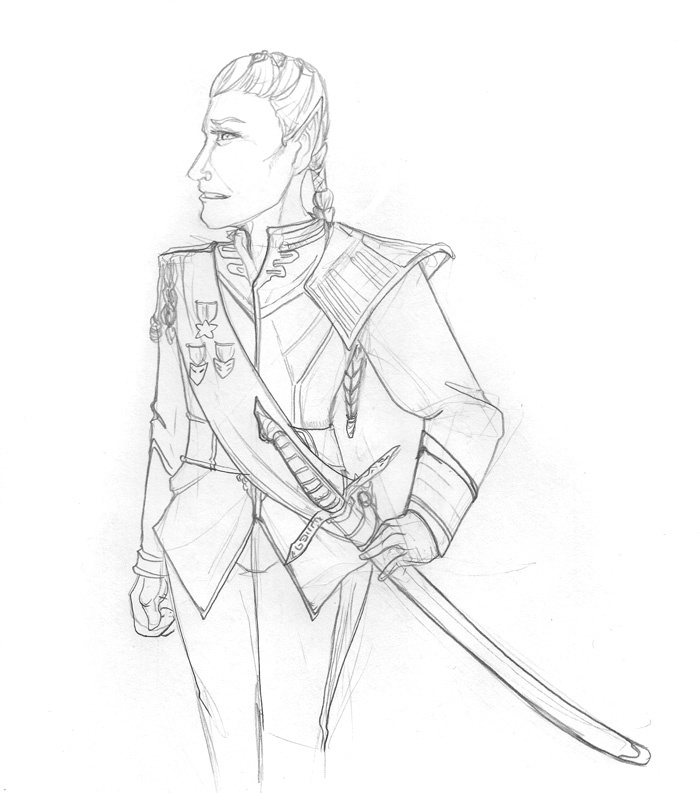 But a conniving Anju managed that night to make it further into fey and prey on some of the green border guards. Killing a number of them – who had been trained for decades but with no practical experience, before becoming more formidable in the field. Den and Marconius, meanwhile, were alone for the first time, and passion came to a head. Little did they know that the anju was watching by this point, and delighting in waiting for the right moment to strike. And just as things were getting heavy, the anju used its magic to puppet Marconius – taking control of his actions and had him draw his sword on Den. Den fought back, but refused to use his sword, not wanting to risk hurting him with Iron, even as the metal drew a blistering gash across his own chest. And in the end, when Den was able to disarm him, the anju killed his friend before him and fled before Den could turn his sword on it. Den was filled with guilt – the one time he had dropped his guard, the man he cared about was killed, and the anju had escaped. He blamed himself; he expected to be punished, he almost hoped he would be. But instead, he was shocked to find he was commended. He had lived through an attack that had killed a number of his fellows, and he had managed to have enough restraint not to use iron on Marconius, even when injured with it himself. This commendation always sat strangely with Den, coupled with guilt. But after this, Den stifled his emotions even more – not letting him grow distracted by thoughts of romance or other emotion. He focused on his duties, and his dedication got him far. Between stints at the border, where most guards would carouse (border guards are very esteemed in the society), Den was always working on bettering himself. And it paid off – he became the youngest yet (at around the age of 250) to hold the title of Captain of the Borderguards. A position mostly dealing with training new guards, vetting their reliability and planning strategies and shifts at the border, but not without seeing action as well. Physically, Sabin is a little taller, but notably thicker of build than Den. Also, eldhe have pointed ears that point delicately nearly straight up. Sabin’s, when extended, point more horizontally to the back/side. Sabin and Den are a veritable odd couple. 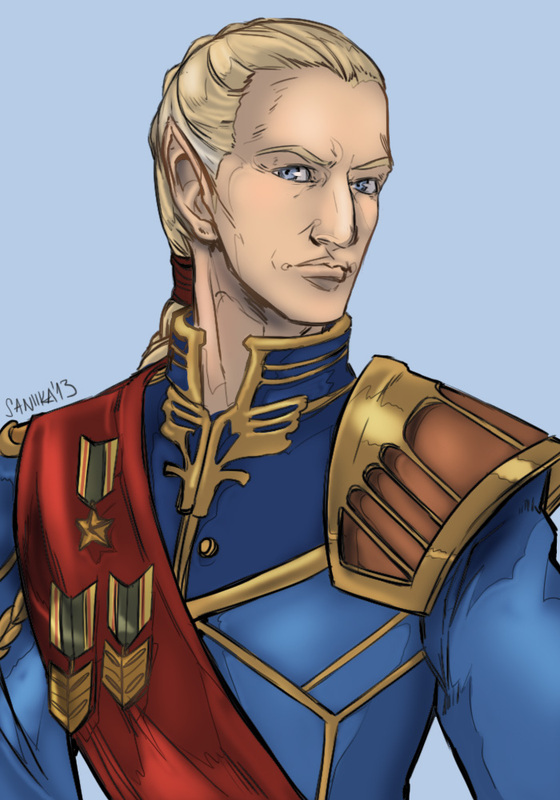 Sabin is half-anju, Den is (or was…) the captain of the borderguards of his nation in the feyrealm, whose duty it is to protect the land from anju – nightmare creatures who live in raw dream and seek entrance to the feyrealm (which is a realm within dream) to … well, eat fey. Sabin’s story is a little complicated, but is a unique circumstance. Most anju are just monsters – cunning, manipulative monsters, granted – but don’t tend to have much drive beyond feeding off of fear-energy and eating people/fey. Sabin is a merging between an anju and a human, with a more developed sense of emotions. While he is a man of extremes – capable of being manipulative, dark and violent, his general attitude is eccentric and curious, excitable and friendly. 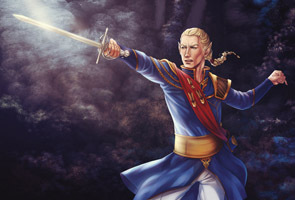 In the story, Sabin’s life was spared by Den when he found himself in the feyrealm after a lengthy interrogation. Sabin left an impression with Den years ago that he never could quite shake, even if he didn’t want to admit just how much of an affect he had had on him. However, much later, they encounter each other again, and one thing leads to another when Den finds himself having to be helped make his way back home to Fey and trust Sabin. Sabin is infrequently serious, playful, and enjoys trying to crack Den’s stony façade. In this storyline, Sabin would have never been with a man before, and has been dealing with the loss of his wife many years ago. He had had a difficult time moving on, and was often faced with the feeling that he was replacing her – especially if it involved someone who reminded him of her. With Den… that is not an issue. 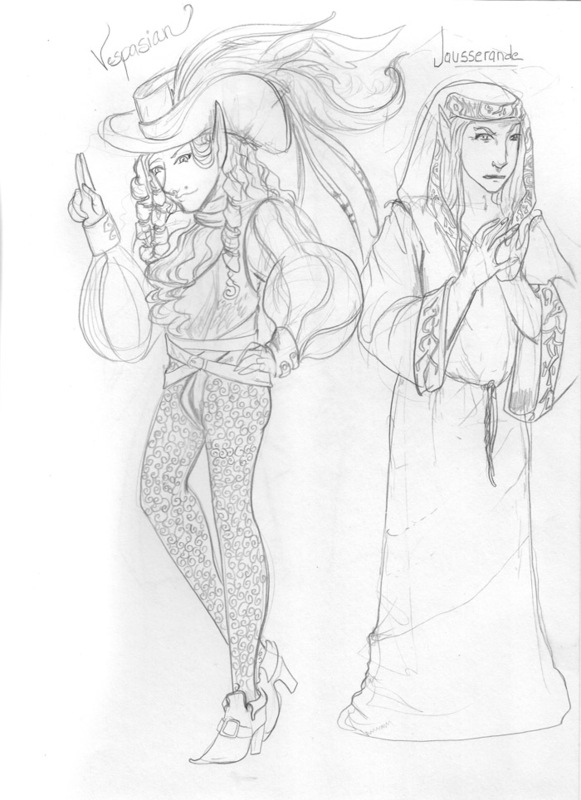 Sabin is also fascinated with magical creatures, and Den is fey. It is a new leaf in his life, he feels like he has his spark back with Den that was mired in a rut for too long. 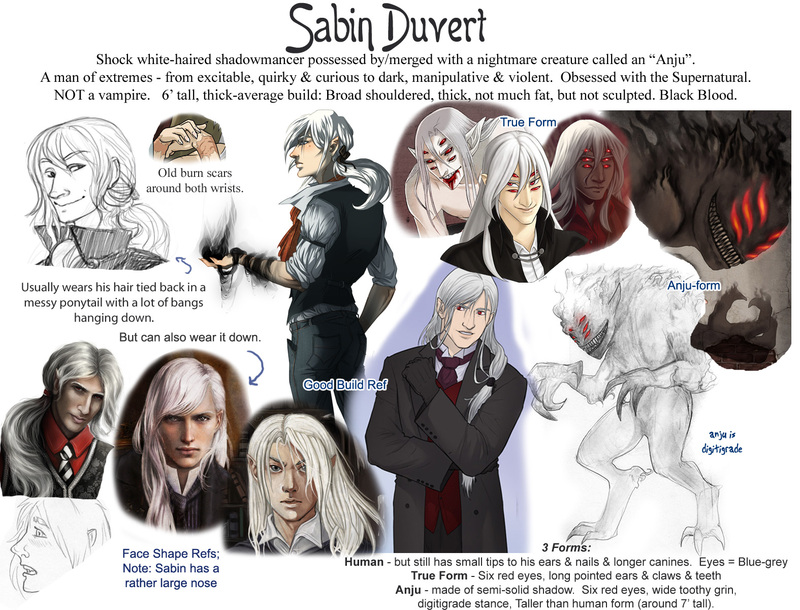 He has always been a try anything once kind of guy, and sharing his life, the wonders of the (modern at this point) human world, and being able to have a lover that challenges him – that is passionate, but at the same time very new to everything, and a little unnerved by him is exciting for Sabin. Den has been repressing a very passionate nature for a long time, and with Sabin it can finally come to the forefront. He is passionate, but private, and still flusters easily. Sabin has a way of getting under his skin, of teasing him and not caring about his status or gruff facade, and finds himself, as much as he knows he shouldn't, really warming to Sabin's charms. However, Den is a man of honor, and despite the fact he is quite concerned with the implications of such a relationship, would be straightforward about its existence, and willing to face the (possibly severe) consequences rather than attempt to hide it and face the scandal of it were to be discovered. Sabin encourages Den to explore his passions – that he shouldn’t be ashamed of his feelings or by not living his life entirely for his work. 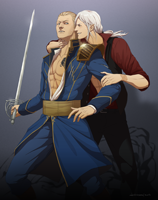 Den, while he would be ashamed to admit it, is excited by Sabin’s nature – of being able to in a controlled situation “lose” a battle with an Anju, give up some of his meticulously groomed control. Den can sometimes be exasperated with Sabin’s cavalier attitude, often unbrushed hair, and failure to think things through, but grows to care very deeply for him.